This entry was posted on April 10, 2010 at 5:25 pm and is filed under 2010 Booker Prize, Author, Tsiolkas, Christos (2). You can follow any responses to this entry through the RSS 2.0 feed. You can leave a response, or trackback from your own site. It’s interesting to see a review of this book from a non-Australian, Kevin. 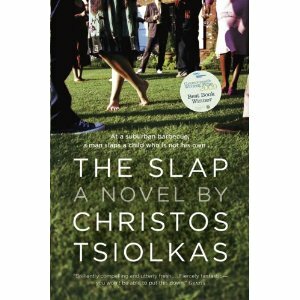 As I wrote in my review (http://whisperinggums.wordpress.com/2009/05/14/christos-tsiolkas-the-slap/ ), I don’t think Tsiolkas is really about the plot here – the actual slap issue resolves quite a way before the end. I do take your point a little about melodrama – he does pack a lot in there – but I think he is exaggerating for effect and this is because, it felt to me, he has some things he wants to say about western society and how we relate to each other. I agree with Whispering Gums: it’s interesting to see a review of this book from a non-Australian perspective. I know, for me, it wasn’t so much an Australian city I recognised (I was born in Melbourne, grew up outside of it, then returned and lived there in my early 20s for a short period but always the city I identify with as “my” own), but more the fact that here was my generation (of 40-somethings) being presented in literature in a way I hadn’t seen before and which I strongly identified with. (Tsiolkas was actually editor of Melbourne University’s magazine when I was an undergraduate, a fact I only discovered recently, so we are of similar vintage.) But I do take your point that he uses characters that are peripheral to the main story lines, but I quite liked this, because it would have been so much easier to follow the main character’s view points. I read “The Slap” last year. I sort of liked it. I thought the actual part leading up to the incident was very good and drawn out nicely. I thought the aftermath of the incident was interesting for awhile. Once Tsiolkas widened his scope away from the incident and into typical societal comment with things like a young man coming to terms with being gay, I thought it became very average. I am in agreement with much of Kevin’s review. If it was shorter and more focused on the central plot point, I would have liked it more. wg. kimbofo, rick: I think the strongest part of the book, by far, is Tsiolkas’ portrayal of the issues facing a middle-age generation (as Kim notes). For the most part, he does that well, but like Rick, I think he lost track and wandered into some pretty obvious, not very perceptive, story lines in the last part of the book. There are few enough novels set in the present time, with characters who reflect the real-life world of many readers, that I certainly would not want to dissuade anyone from reading this book. I couldn’t help feeling, however, that just a nudge more could have turned this into a truly exceptional book. Lisa: The Australia parts move very well, particularly to another Old Dominion. In many ways, setting a study of ordinary middle-class, middle-aged achievers in Melbourne is more appropriate than, say, London or New York. And I think part of my frustration is that this book comes so close to being very, very good, but falls just short of that mark. I do agree with you to a degree – and I think it’s the packing in of a bit too much that probably does it. Too many “dysfunctions”/human errors perhaps without mediation? But perhaps it depends on how we see it – Realistic? Or, hyper-realistic? If we see it in terms of the latter, maybe it works a little better? wg: I think my problem was that I found the last two sections so predictable that it caused me to question the rest of the book. Yes, I can understand that – the bit about Aisha on the conference? And then Connie etc? I wouldn’t rave as some do but my reading practice tends to be to look for what I think the author is trying to do and try to understand that. As a result I often end up sounding like I like a book more than I may have at the start. That’s certainly how The little stranger has worked out for me! I tend not to react emotionally – even when books make me feel emotion, if that makes sense. Oh dear … I didn’t mean here that your reaction is emotional! I was blabbing on about my style and suddenly realised it might be taken the wrong way! I didn’t think you were implying I was reacting emotionally. If anything, it was the opposite — I got the impression the author was tidying things up. Which was too bad, because until then he had done a pretty good job of creating a diverse cast of characters. I finished reading The Slap a few weeks ago, and really enjoyed it. One reason why I found myself reading it so quickly was my hoping that Tsiolkas would return to certain character’s point of views. I didn’t want to skip ahead in the book to see if he would return to them, so I just pushed through and hoped I would again experience things through Aisha or Harry’s eyes. Although they weren’t the most likable characters, I found them the most interesting. I think I agree with most comments above that this is where the real strength of the book lies-the characters. Welcome, Anne-Nicole: I agree that the best part of this book is the way that the author introduces us to people who might live next door (even though for you and I they are a world away, literally). Like you, I had some favorites that I wanted him to return to — some he did, some not. Hm, half way through this review I was expecting to be adding this to my TBR pile, the idea of a slap echoing through people’s lives that way was an interesting one and the quotes weren’t bad at all. But it sounds like it eventually tries too much, takes too broad a scope, gets a bit lost. I’ll wait and see what he does next. Or, look at what he’s done before this as this is his fourth or so novel. His novel Dead Europe was very well reviewed (though must admit I haven’t read it). Are there any of his past novels you would particularly recommend? I’ll check out Dead Europe, I like the title for a start. To be honest, this is my first of his. My response to you was really to say that he has quite a body of work already that has been well reviewed. Dead Europe is probably the one I’d read next of his. Loaded was made into a film, Head on. He is apparently a rather gentle man, but his books tend not to be about gentle people! This is my first Tsiolkas so I have no useful advice (although I too find Dead Europe to be a promising title). If you have the time, Max, I think you would find The Slap a good fit with your tastes. We are both impressed with the way that Selvon conveys an immigrant community in London — one of the themes of this book is a look at how immigrants play out in a much younger, more fluid society (and Australia is not unlike Canada in those conditions). I know you are also reading Proust and think you might find this an appropriate “interlude” book. Just as Proust explores a community in turn of the century Paris, Tsiolkas looks at a community of people in Melbourne, half the globe away and a century later. I did not dislike the end, incidentally, I just felt it read flatter than the rest of the book — and that could well be more a reflection of my expectations than a criticism of the book.